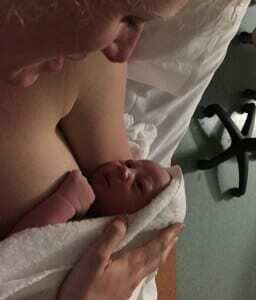 Back in 2013, Hypnobirthing Australia mum Heidi shared the inspirational story of her 1st hypnobirth with baby Benjamin (you can read it here). Now she shares her 2nd AWESOME birth story of baby Felix, with us! Pretty much exactly two years after the birth of our first Hypnobaby Benjamin (born 31/08/2013), our second baby boy was due to come into our lives. It was on the Friday night (4:30 am) that I started to feel light surges that started to quickly become regular. It was just like last time, baby and I alone in the dark getting excited about meeting each other. It was the most exciting feeling. I breathed up with each surge, filling the inner balloon, imagining my baby in the perfect position for birth. At 6:30am I got up and walked out to the lounge room where my Mum was sleeping on the couch. I told her what was happening and she told me that she had just received a phone call to say that our Aunty M (Mum’s step mum) had been taken to hospital and it was not looking good. There were mixed emotions at the house at this time as Mum had to go straight to the hospital. My surges were already coming along regularly and close together. I felt as though it would not be a long time until we met our baby. As much as I really wanted Mum to stay with me, I told her that I would be fine and baby would wait for her (In my heart I was terrified that she would miss the birth). So off she went, promising to be two hours at the most. As soon as she left my surges slowed down and became irregular sometimes with really long amounts of time in between. My mind had told my body that we were not having this baby without Mum there and that we would wait until she came back to get serious. I had a shower and got dressed in the same outfit I wore for Benjamin’s birth. I looked at myself in the mirror and said “Here we go again girl, yay!” I spent the next few hours with my son Benjamin and my sister, sitting in the sun and playing around. I wrapped Benjamin’s birthday presents for his birthday on Monday! When I had my surges at this point, I was breathing up and using the inner balloon visualisation. My sister didn’t think that I had had any surges in that time because I was so quite about it. She didn’t even notice! She was really surprised when I told her that I had been having surges all along. At this point I did find it hard to relax and was feeling quite anxious that Mum was not there and that our Aunty M was very unwell. It was really hard to get into my zone and so I was using the techniques but was unable to go into my bubble or use any other deepening techniques. I felt like I needed to be alert in order to fully interact with my family about what was going on. It was hard. Around lunchtime my Mum called to tell us the sad news that our dear Aunty M had passed away. My heart was sad and I cried, I could feel my surges getting stronger and as I thought of Aunty M, I could see her standing in front of me saying “Don’t think about me right now, you concentrate on having this little baby”. I knew that if I allowed myself to be sad and really feel the moment that it would be almost impossible to get myself into the zone I needed to. I thought of the Circle of Life; how one dear soul had left this earth and another little one was about to enter into our world. What an emotional, spiritual moment this was. Mum returned from the hospital, we had a big hug and a cry, looked into each other’s eyes and said “Let’s do this”. By this time it was about 1pm. Matt had put my candles on and set up the stereo with my relaxation music and Hypnobirthing tracks playing. Pretty much as soon as Mum had returned, my surges became much stronger. To get myself in my zone, I listened to ‘Surge of the Sea’. When each surge came I would ‘flop’ my whole body onto Matt or Mum and breathe my tummy up. I started to imagine being at the beach swimming in the ocean and just as I did two years ago, I dove into those surges, diving in and being carried up and over the ocean waves. Matt was doing the light touch massage and the endorphin release (stroking my forearm with his hand). This technique was awesome. Matt used this at this stage and then later on. It was something that I really liked in our hypnobirthing practice (we didn’t use it in our last birth) and I looooved it on our birthing day. It was about 3:30pm when Matt and Mum suggested that we go to the hospital. I felt as though I really was not that far along as I felt quite comfortable and the surges were strong but totally bearable. They were coming quite often though and as I had arrived at the hospital fully dilated with my last baby, we thought it might be a good idea to get to the hospital a bit earlier this time. As soon as we got to the hospital, I started to wish (and say out loud quite often) that I wanted to go back home. It was very bright and clinical looking (as it was a hospital!). We went to the assessment unit and saw the midwife. She checked to see how dilated I was and I was only 4cm. As I had expected I wasn’t too far along. We went to the birthing suite and were lucky enough to score a birthing pool! The room was very bright and kind of scary looking. I really wanted to go back home at this time. Matt ensured me that we had made the right decision and that everything would be OK. He asked the midwife to dim the lights and he set up our candles and put on my relaxation music. I sat in the chair for a while and flopped onto Mum or Matt during my surges. I was still finding it hard to relax and felt like I wanted to lay on the bed with my knees up to my chest and close my eyes. I remember wanting lots of pillows to surround myself. I hopped on the bed and requested the “Rainbow Relaxation”. As soon as I heard those words “Its time now to allow your body and mind to relax” I felt at peace, like I was home, all tension went away from every part of my body (My Mum later told me that she felt my whole body relax and go limp). It was time now to get serious! I would feel the surge coming and would visualise my amazing uterus working (I could literally feel it doing its job) I could see it working and see my baby moving along on his way! It was really cool. I kept saying “go baby go, you are doing so well”. Sometimes I would also see the ‘satin ribbons’ just floating up and unravelling. I was able to come in and out of my zone easily although I really didn’t want to and didn’t have to do this many times. The couple of times I did (like to ask Matt to change the track on the stereo), I would quickly go back to my zone by saying in my head “3, 2, 1”. I would visualise myself stepping down three steps onto the beach. This was a technique I had practiced lots during my pregnancy- I visualised myself at my favourite beach at the Sunshine Coast, walking along the wooden path to the beach and down the 3 wooden steps to the sand. The sand was then made into steps. If I needed to go deeper I would then count “3, 2, 1” again and walk down these sandy steps. This would all happen incredibly quickly and I would be back in my zone in 3-6 seconds. I was so far within myself that I could see my baby moving down the birth path. I could hear voices on the outside but just as Melissa had conditioned me, these voices (the midwife) just made me go deeper within. At one point I was having a surge and the midwife came over and started making conversation. Something about “Oh so you’re going to have two boys now”. At this point Melissa’s voice came over the stereo saying “During your birthing, you may hear voices from the outside. However, they will not distract you they will help you to go even deeper”. I laughed to myself at the timing of these words and went deeper into my zone. It was comforting knowing that my birth partners were there to communicate for me so I could concentrate on birthing our baby without interruption. After a while of being on the bed, I felt like I needed to go the toilet. So we all moved over to the toilet. From the time I laid down on the bed to the time I got up to go to the toilet was almost two hours but to me it felt like fifteen-twenty minutes. I was in such a hypnotic state that I had experienced time distortion! This was something that we had heard about in our hypnobirthing class and it was really cool. I continued to have a couple of surges on the toilet and then suddenly felt like my surge breathing was no longer working (just like Melissa explained). I felt like I needed to start breathing my baby down. Before I had even thought it myself, my body had started breathing down. I remember thinking “Man! That was fast!” as it had only felt like fifteen minutes to me! Yay! For time distortion! With this, I looked at Matt with what he described to me as “the look” (He later said he knew it was time when he got “the look”). He turned to the midwife and said in a stern yet polite voice “Can we please get that pool filled?” She said “Yeah OK then” and started to casually fill the bath. Five minutes later, I was in the pool. It was around 6:30pm when I climbed into the pool and it was heavenly. I started to float in the warm water with Matt holding me up by putting his arms around my shoulders. I was able to just completely relax, floating in the water and surrendering to the amazing sensations that were happening inside me. I thought back to the video we had watched in class of Helen, who had floated in the pool on her pool noodle and gave birth so quietly and peacefully. I felt just like her. I was doing it! I was giving birth just how I wanted too! I was so excited! With each surge I breathed my baby down, just like I’d practiced many, many times before. I hadn’t mastered this technique with my first and with this birth I was determined to get it right! I was doing it perfectly! I was so proud of myself! It was much easier when I surrendered to the surges and breathed down rather than this “pushing” business! As I breathed and beared down I made the noise “Om” like a Buddhist monk!! “ommmmmm” I would meditatively say as I directed all my love, energy, spirit and breath down to my baby. My baby and I were one spirit working together as he came closer to being in my arms. In between surges I was talking to him saying “I love you my baby, I’ll see you soon my baby”. Then back to the “om” as I breathed him down. It was purely magical. His little head started to crown and the midwife shockingly said “Oh my goodness! I can see his head!” She then declared “You can’t actually have the baby yet, I’m not a qualified water birth midwife! She doesn’t start for another 20 minutes!” I then popped out of my serene, meditative zone to politely inform her (with swear word included) that “Well! I’m not getting out of this pool! !” and then popped back into my zone. She and the other two midwives were quite concerned about this however I could not have cared less. For all I was concerned I didn’t even need a midwife! 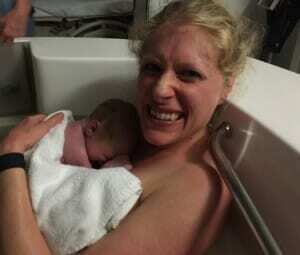 I had my baby, Matt and Mum and we were rockin’ this birth! With my next surge, I ‘ooooommmmed’ my baby’s head out. As soon as his head was out the peaceful, sweet presence of his little soul was so strong. I could feel him moving his head around, having a look around. He was still in his amniotic sac (in the caul). As I beared down again, his body slid out and I picked him up out of the water. As he came out I could see his head still in the sack as I lifted him up towards me the sac broke and Felix was released into the world and into my arms. My little baby Felix. My sweet, quiet little Felix was here in Mummy’s arms. We had done it. We had had the birth I Had dreamt about. Felix didn’t cry. He made some little noises as he looked at me with his big soulful eyes. He was saying “Hi Mummy, I’m here, I love you”. He was born at 6:41pm. The three midwives in the room were in tears. They were astounded. My original midwife said that “I was the reason she became a midwife” and that she would be talking about my birth for years to come. I said to her “See I told you he was ready to come!” He he! We had skin to skin for an hour and cut the cord about 30 minutes after his arrival. I birthed my placenta naturally. Little Felix started breastfeeding straight away. He gently guzzled down my milk for the first time, with his little hands on me. He was very hungry after his journey. I felt as though my Aunty M was there for the whole birth. Her spirit was with me, welcoming Felix into the world, on the day that she left. Matt, Mum and I had done it again. We really are Hypnobirthing stars!! It was an amazing, spiritual and empowering birth. One that most certainly wouldn’t have been possible without Hypnobirthing! Hypnobirthing rocks!!! I can’t wait till I get to do it again!